Did you know that 17% of Americans age 65 and older report vision trouble? Age-related macular problems are at an all-time high. Age-related macular degeneration (AMD) is the most common cause of sight loss in the developed world and as our population ages we face an epidemic of AMD. Age-related macular degeneration or AMD currently affects over 1 million Canadians, and this figure is expected to double by 2031. What is age-related macular degeneration or AMD? AMD is a progressive, destructive disease of the central part of the retina called the macula. It is a very small area, only 5 mm across, but cone photoreceptors are concentrated there. They are responsible for most of our detailed vision, color vision, our ability to drive, read or recognize faces. The macula is responsible for focus, fine vision and color differentiation. How does age-related macular degeneration (AMD) develop? The underlying layer of the retina is called the retinal pigment epithelium (RPE). It begins to die and it can no longer support the photoreceptors above it and as a result, the RPE cells of the macula dies. You can see that vision becomes less sharp and colors fade. As more photoreceptors die, irregular gaps occur in the central area of the vision. The global macular degeneration or AMD drug market was valued at $5.4 billion in 2014 and is expected to rise to $7.9 billion by 2019. Under economic analysis, these drug costs represent only 18% of these enormous and growing costs. The cost of detection, treatment and family social care represents an additional 82%. How is quality of life affected by vision impairment caused by age-related macular degeneratio or AMD? With our aging society, we face an epidemic of macular degeneration in coming decades. As its name suggests, AMD overwhelmingly affects older people. One study suggests that 54% of people over the age of 60 have early AMD: meaning they have changes in their retina but their sight is not yet affected. The results suggest that while AMD is relatively rare in people around the age of 60, about 1 in 2000, it quadruples in each successive decade to about 1 in 5 by the age of 90 years. What you can do to protect your eyesight against vision loss caused by age-related macular degeneration. The good news is that 90% of macular degeneration or AMD cases do not progress to severe vision loss. Studies show that the right nutritional support and healthy habits can significantly reduce your risk of age-related macular degeneration and support and maintain your healthy vision in AMD. Take supplements for macular degeneration, which are specifically designed to support eye health in AMD. Fortunately, natural nutrition has been found to promote clear, healthy visual health in older adults. Our eyes rely on antioxidants to protect against the oxidative damage that occurs daily. Saffron 2020 delivers the best sight-supportive nutrients in one powerful formula, providing outstanding support for a lifetime of vision health. Saffron 2020 delivers 10 sight-promoting nutrients in each vegi capsule, to be taken once a day. Saffron 202 helps support the vision health. If you have a senior friend or family member who might benefit from vision nutrition, give them the best: Saffron 2020- The only patented saffron supplement for eye health! Saffron 2020 promotes healthy vision while supporting normal eye function. With antioxidants, plant extracts, vitamins and saffron and resveratrol , Saffron 2020 a protective shield for the eyes. Start caring for your eyes with Saffron 2020 dietary supplement. Saffron 2020 helps replenish important eye protecting nutrients that you can lose as you age. Saffron 2020 promotes healthy eyes. Saffron 2020 contain 6mg lutein and 2mg zeaxanthin and studies suggest a relationship between these two carotenoids and the maintenance of a normal healthy macula and clarity of the lens of the eye. There is no cure for AMD, but Saffron 2020 provides nutrients that are important for maintaining healthy macula and vision. Saffron 2020 eye health supplement for those affected by age-related macular degeneration or AMD. 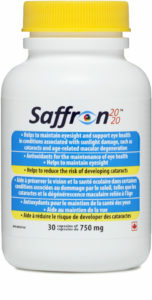 The vision and eye health health supplement Saffron 20202 is approved by Health Canada. This patented vision supplement with saffron and macular degeneration vitamins, which is used once-per-day contains 10 essential eye nutrients for general eye health and specifically for those affected by AMD or at risk of developing cataracts. Manufactured in a certified facility in Ontario, Canada, Saffron 2020 provides the most important eye health nutrients to help you maintain optimal eye health and support eyesight. Among all of the macular supplements, only Saffron 2020 contains a patented combination of saffron, resveratrol, lutein, zeaxanthin and macular vitamins (vitamin E, vitamin C, vitamin A, vitamin B2) in addition to zinc. Lutein and Zeaxanthin are critical antioxidant carotenoids for the macula of the eye. Lutein is an important carotenoid present in the macula or central area of the retina. Lutein helps maintain eye health. Lutein and zeaxanthin, are found in fruits and vegetables, and they promote greater pigment density in the macula of the eye. Acting as primary filters of high-energy blue light, lutein and zeaxanthin isomers support visual health and acuity by protecting against oxidative stress and inflammation. Lutein is an eye-protecting carotenoid and antioxidant that helps guard against the damaging effects of free radicals. Lutein with Zeaxanthin can contribute to the protection of your eyes from blue light. Lutein supports eye health and helps with contrast sensitivity, one of the key factors that contributes to night vision. It also has antioxidant capabilities that help to filter out the high energy blue light from digital devices, which may lead to oxidative stress and free-radical damage to the eyes. Lutein and zeaxanthin are carotenoids that are naturally found in healthy eyes, but your body can’t make them so you have to get them through your diet. The body’s natural supply of these carotenoids may also decreases with age. Saffron 2020 contains 10 most importatn eye health nutrients and is an excellent choice for eye health.